1. I had a weird week. 2. Some good things happened. 3. Some bad things happened. Bad. Things. 5. I read a fantastic article about "parenting" this morning. You will love it! Read it here. 6. I was reading a blog post about "living well" on a blog about "living well". It was a decent article about 10 thing I could do to make my life "well" - things that if I did them all the time would make my and your life pretty fantastic. It also makes me wonder about this . . . What do blogs like this write about after they've told you need to drink water, exercise, be grateful, manage my money, rest, etc.? 7. I'm a little sad that Downton Abby is going to end. It makes sense that it would end, just as historically their way of life would drastically be changing. But those changes are very interesting to me. I want to know what happens to these poor stifled people after they break out. 8. It snowed here yesterday. Booooooo! 9. It's Saturday and I should be accomplishing something. 10. It's also 11:53 and I've done nothing. Haven't dressed. Haven't taken my medicine. Haven't made breakfast. I did turn up the heat. 11. Is a week too long to make a craigslist person wait for me to arrange to pick something up???? 12. My sister texted me this morning. She bought tickets for us to see David Sedaris while I'm visiting next month. Very exciting. 13. She says they are bad seats. I'm not sure what a bad seat means when you are listening to a writer/speaker/comic. 14. I'm still a little haunted by the patient on Grey's Anatomy that had a leech living in her sinus cavity. Ewwwwwwwww. 16. I was speaking with someone the other day who NEVER watched ER. REALLY????? Who never watched ER? I mean NEVER. 17. The sun just went behind a cloud and it is now dark in my house. All the more reason I should be in my pajamas. 18. My favorite ice cream place now has a flavor called Michigan Pot Hole. Sounds gross huh? It is delicious. It is a good thing it doesn't come by the gallon. 19. I need to start making a little money from my blog. Would you hate me if I started doing sponsored posts? 20. Even though it's cold outside and snowed yesterday, I guess it's time to take down my winter mantle. 21. Taking down the winter mantle means I have to put away the stuff on the mantle. 22. Putting away the stuff on the mantle means I have to make space to put it away. 23. I wish there was a way for my basement to just expand and shelves magically appear when I need to put something away. 24. Not cleaning the basement in January was a BIG mistake. 25. Would one of you PLEASE come visit me and help me clean my house????? I will not come clean your house till mine is done. What bad things happened? You will absolutely love David Sedaris--there is no such thing as a bad seat.! 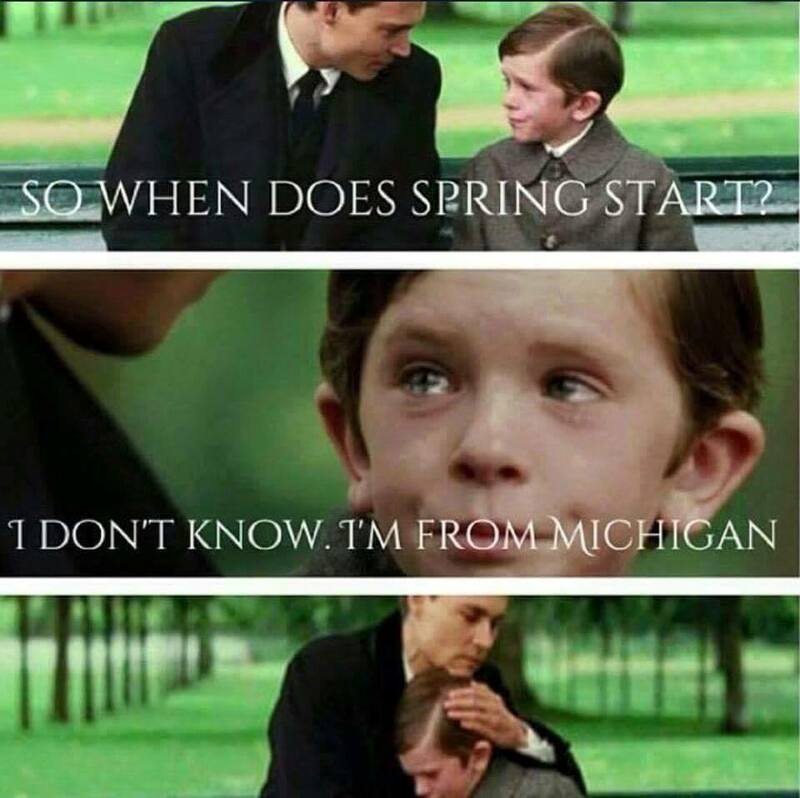 Sounds like Ohio (NE)is just about as bad as Michigan this (spring?). Love your blog--painted furniture, words of wisdom, and late day PJ's! WE LOVE YOU, get ye some sponsors! Are we supposed to be getting out of our jammies on Saturdays!!?? If I were your fairy godmotherreader I would bibbity bobbity you some shelves and a huge basement, and then do the same for me. You are too funny; keep it coming, girl! I would be one of those weird friends that would love to come and help you organize your garage/basement whatever! I now have a friend who is willing to help me with stuff like that. At her insistance, we spent 4 hours painting my 3 hallways yesterday! It sounds like you are a little in despair. Let's finish today maybe with the resolve that tomorrow will be better and you will be more physically productive. Take a deep breath and love what is going on right now. We all need down time every once in awhile. Let today happen, and maybe tomorrow, you can make a today happen. Please work on the basement expanding/shelves showing up thing and then post a tutorial. I could really use that info. I hate when there are leeches in my sinus cavity.